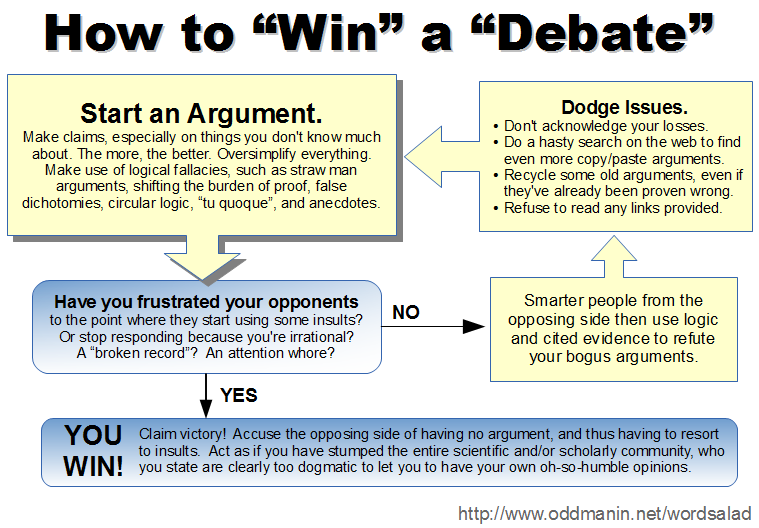 After getting into so many debates with creationists, I've noticed some patterns to some of their debating "techniques". The flowchart you see above is my summary of one of these recurring themes. Conspiracy theorists often do the same sort of thing. Does this mean that we should just ignore people like this all together, and never respond? Never indulge these loonies in debate, ever? Well, not necessarily. Even if you'll never be able to educate the one particular idiot who's engaging you in debate, there may still be on-lookers who sincerely don't know much about the subject and want to learn. They should realize why the opposite side is wrong, and why critical thinking is important. Never mind the fact that being able to stand your ground and defend your position is, I believe, an important communication skill to have. The nice thing about message boards is that it's generally easy to go look up things that other participants have posted. It's much more difficult to do this in verbal debates or chat rooms. When you can post links or similar references to older posts, you can spare having to repeat yourself, but just pointing to a link and saying, "Here's a different thread where somebody already answered that question", or "No, what you just said actually contradicts what you said in this earlier post." From the Amazon.com "Evolution" discussion forum. Last updated May 9, 2015. This list in its entirety used to be posted now and then on the Amazon.com "Evolution" forum, but that was when it was still reasonably short. I stopped posting the whole list once its size began to exceed the maximum number of characters you can have in a single post. Still tosses around the word "materialist" around to describe anybody who isn't a creationist. Similarly claims that these people claim that nothing exists except for matter (even though you don't need to be a creationist to see the scientific evidence of things that aren't made of atoms). He calls this "that 1950s materialistic ideology". Doesn't understand the meanings of the terms "theory" and "law" as they're used in science, even after he had it explained to him several times. He was even given a link to a middle school science site that explains the difference. Kept posting "asknature.org", and also posted several YouTube clips, claiming that all of these had evidence for intelligent design. They didn't. Asknature.org is a website about manufacturing engineering which uses the term "intelligent design" to mean something completely different (namely smart engineering solutions by human engineers). One clip was from the creationist thinktank, the Discovery Institute, and didn't have any argument beyond "this looks really complicated". None of the other clips (including a 1941 science education reel about the human eye, and a pseudo-science documentary about psychic power) seem to mention ID/creationism at all. Has shown time and time again that he can't grasp the concept of metaphors or analogies. This includes analogies with music, spoken languages, coin flips as a probability model, computer CPUs, metaphorical words like "purpose", "design", "recipe", etc. (see the link below for a post which contains post links to each of these examples). First he says that that science should "stick to what is observed. Stop creating hypothetical stories on what you think could have or may have happened about something no one has ever observed", but that "Our designers cannot be directly observed to know anything about them." Which means that his own alleged evidence of a designer (if he had any) should not be trusted. In general, R.Morris claims to be big on "observable evidence", but when it's actually shown to him, he either falls back on solipsism and pure speculations that have no support, or says to "consult philosophy and religion for that answer" because "Science is not a reliable source for the existence or who of our designer/s." R.Morris's only answer to some of these questions has been two words, "Your mother". At the same time, he constantly cries foul whenever insults are directed at him. Even though it has been explained to him numerous times that 1) the people insulting him are only throwing in the insults in ADDITION to the refutations of his claims, and 2) his behavior has earned these insults. Claims that Carl Zimmer, in his National Geographic article, said that birds evolved feathers because ancient lizard jumped out of trees and that caused their scales to fray. On one hand, R.Morris accuses biological evolution of being a "religious ideology" and dogmatic. But then whenever discoveries in evolution are worded in a non-assertive way, he accuses it as being too unsure and purely hypothetical. Still doesn't understand why alleged UFO sightings of today, even if we were to assume they were evidence of alien visitors, isn't evidence that there were aliens 200,000 years ago who genetically engineered humans. Never mind the fact that he doesn't understand that eye-witness testimony isn't how the scientific method works. Likewise, he believes that all creation stories are ultimately based on the Sumerian one, when in fact they aren't. When presented with 20 different creation stories from around the world, he couldn't show how they were derived from the Sumerian story. Keeps trying to play the "I'm entitled to my own worldview/opinion" card, even after he's had it explained to him why it doesn't work in his case. Claims that no currently-living species have any genetic traits that were due to a genetic mutation, and claims that all of these traits were "pre-programmed". Refuses to answer the question "If we found evidence that an inherited trait (maybe even a widely-recognized trait in a particular species, not just some anomaly) traced back to a genetic mutation, would that disprove your claim here? If not, then how would you explain it? ", even after he was asked several times. R.Morris kept implying that evolution means an organism of one species "morphs" into an organism of a different species, when it was explained to him several times that this is NOT how evolution actually works. R.Morris claims "FACT: Fish will only produce other fish, PERIOD!" But then when asked to define "fish", he couldn't give a working definition. Which meant he also couldn't answer (and kept avoiding) the question "If we can go further and further back and see examples that deviate more and more from the current fish we started with, until we arrive at something that no longer fits the definition of fish given ... then would you accept that as evidence that your claim is wrong?" Also still couldn't answer "if there's a limit to variation, then what exactly is it? Is there some sort of "glass wall" that limits the diversification? If so, what are the limits? How are the limits enforced? Could you give 3 examples? ", after being asked several times. R.Morris claims that all "macroevolution" took place before the Cambrian, namely by saying "Kingdom down to Family was established before the Cambrian". But then when asked to present evidence of a pre-Cambrian existence of the class Aves, or the class Reptilia, or the order Testudines, or the family Hominidae, he couldn't do it. Instead, he said that these were only being categorized "according to the ideology" of evolution. He couldn't answer what categories, then, he really meant by "kingdom down to family". Keeps trying to refute the evidence of the chromosome fusion on human chromosome #2 (evidence of common ancestry between humans and other apes, which explains the difference in chromosomes) by saying that this particular fusion doesn't explain the differences seen between apes and humans. He still kept using this argument even after it was pointed out that it's an irrelevant non-sequitur. This was after he already failed with trying to explain it away as "common design" (which he's always failing on). Keeps insisting that there's a "Law of Biogenesis" in science and/or that spontaneous generation is the same thing as abiogenesis, even after the difference has been explained to him numerous times. Claims that "consciousness exist [sic] above and outside the realm of life", but can't show an example of a consciousness that exists outside of the realm of an organism. Keeps claiming that human bones from 2.5 million years ago existed, but still can't back up that claim. Claims that "worms", "bacteria" and "plants and trees" were created for certain purposes. But the evidence of when they each came about doesn't match up with his claims. Claims that God "did create the universe, Physics tells us that." But can't back up his claim. Claims "never has it been demonstarted that heritable genetic information leads to a new type of organism", but was given examples. Still won't define what he means by a "kind" (even though he still demands evidence of evolution producing new "kinds", and ignores all of the examples he's given). He's used "kind" to refer to entire taxonomic families ("felines", "deer"), orders ("whales"), infraclasses ("marsupials"), classes ("birds"), phyla ("sponges"), and even domains ("bacteria"). UPDATE: After countless times being asked, he finally said that "kind" was the equivalent of the taxon "family". But this contradicts the other groups that he's called "kinds". Insists that dogs (canines) and cats (felines) are two different specially-created "kinds", but has been shown the evidence on several occasions of common ancestry between the two of them. Whenever he's asked if evidence of a common ancestor would thus prove evolution to him, he never has an answer. Dismisses paleontology as "guess work, fantastical stories abou events never witnessed", but has the nerve to directly accuse paleontologists of being biased because they won't take the word of people who are clueless about biology. Also seems to redefine "theist". Tried posting a photo of an alleged alien/human skull hybrid, when in fact it was just a carving sold as a novelty/art item (the URL even had "ProductImage" in the URL). Also posted a "starchild skull" photo, but ironically the photo was taken from a page DEBUNKING the alien DNA claim (http://arthropoda.southernfriedscience.com/?p=2435). HERE ARE THE BEST ONES! In short, he believes that something only exists when he can convince himself of it, however easy or difficult he may make that out to be. He knows "for sure" that "man, through scientific research, creates horrible viruses and diseases today", but can't seem to give any examples. Considers the Miller-Urey experiment was a failure because it didn't produce actual organisms, even though it's been explained to him that this wasn't what the experiment was to show in the first place. "But finding out HOW it was done is scientific, it's called reverse engineering." How would you reverse engineer a terrestrial animal from a whale? Believes in giant humans, even though the math doesn't add up. Believes the Smithsonian is hiding them in secret vaults! Similarly claims that there wasn't a natural origin of life because he's not getting an explanation for how. When the same question is asked of his belief, he literally said that he can't explain how it was done but still believes it. Claims that since the Earth has a vibration, and that a vibrating cup of sand and rocks will end up with the big rocks on top, that this explains why fossils of bigger animals are on top. Of course, he wasn't able to explain why we find fossils of some smaller animals in higher strata then some bigger animals.